Other MIDI accordion sound expanders. If you need full automatic accompaniment or workstation facilities you may need something bigger than the "Partner"
Here are some of the alternatives. Are you registered to receive 'Accordion Today' ? Our free magazine sent quarterly. Lots of info and happenings. Call us. 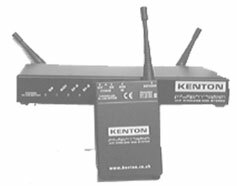 The Kenton wireless MIDI system. If you need to move around , unfettered by wires and cables and yet still play your MIDI, then this system will let you do this. British made - so no 6 week wait for service or customer help. 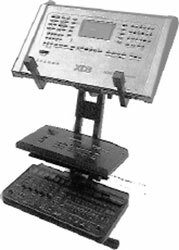 This is a WEM powered device which will transmit your MIDI messages up to about 50 metres - including all program changes etc. Only obtainable from us - because we are the only ones who make them ! You put all your main all singing, all dancing expander on the separately height adjustable, tilt-able top and two modules on separate shelves underneath. Connect them all up on a multi plug and they all power up together, all ready to go. Single cradle version £60 plus. (now with built in echo and reverb) and the Petersen Chromatic Strobo Tuner (probably the best available tuner). Call us or see the WEM website for more details.